Inspirational workshops and music making with LYSO and LSSO! 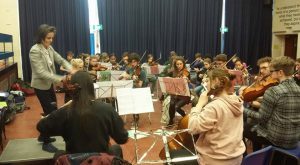 On 11th February string players from the Lancashire Youth Symphony Orchestra and the Lancashire Schools Symphony Orchestra delivered a sold-out String Day – young string players from across Lancashire enjoyed a free fun day of music making. 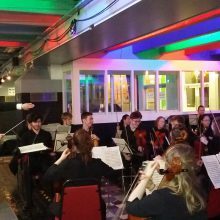 They worked with inspiring Lancashire Music Hub’s LYSO tutors, young professionals from the Piccadilly Symphony Orchestra and the orchestras own players to improve their musicianship and ensemble playing skills. The workshop was suitable for all levels and designed to be fun and engaging for all those involved with the day culminated in an informal performance for parents/carers and friends. All the String Day participants have the chance to perform a piece as part of the Family Music Day, alongside LYSO and the acclaimed Piccadilly Symphony Orchestra at Preston Guild Hall in March. Lancashire Youth Symphony Orchestra (LYSO) offers young people the opportunity to work with inspiring leaders and professional musicians, alongside like-minded young people from across Lancashire. They give musicians the opportunities to work in workshops including String Days, Conducting workshops and more. Most recently, the LYSO were recently invited to play a curtain raiser performance in the LIVE area of Preston Guild Hall before the recent Royal Liverpool Philharmonic Orchestra concert. The pre-concert performance was a great opportunity for the LYSO to showcase their talent and play to a live and knowledgeable audience and a true mark of their ability to perform to such a high level. The orchestra were keen to thank the Royal Liverpool Philharmonic Orchestra and the Friends of the RLPO and the Guild Hall for providing the young musicians with the opportunity to listen to the concert that evening. An inspiring experience for any young musician. To find out more about opportunities with LYSO and LSSO click here.